What a lovely week we have had! We finished our literacy unit by writing a book review on ‘The Butterfly Lion’. The children enjoyed expressing their views using a range of comparative and contrasting conjunctions to support their ideas. We also completed some RE this week. We looked at Islam and focused on ‘The Five Pillars’. Then, we compared our understanding of ‘The Five Pillars’ to ‘The Ten Commandements’. Children had the opportunity to write five rules of their own. We have been ordering and rounding decimals this week in maths. Children have enjoyed this and they have four happy teachers! Please ensure that permission slips are back after Easter. Most importantly, we hope that you all have a happy and safe Easter! We have had a lovely week this week and the children have been working incredibly hard during their assessments. We are super proud of them! We hope you all have a lovely weekend and enjoy the sunshine! Friday - Mufti day in exchange for MPA Bingo donations. Year 4 donations are Easter eggs! Topic work this week has provoked many thoughts and discussions. 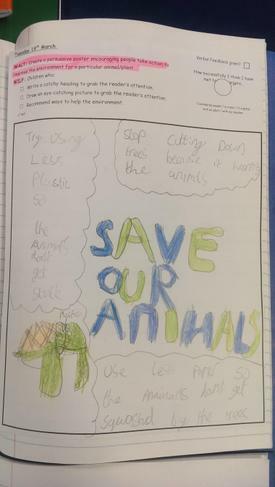 Children have been learning about endangered animals and how we as humans can help them and their habitats to survive. We looked into the dangers of plastic waste, illegal poachers, cutting down trees and global warming, and the effect these issues have on animals and their habitats. 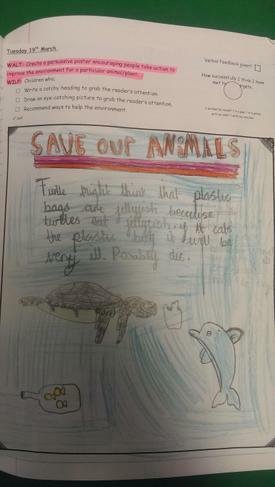 We were so impressed with the knowledge that children already had on looking after the environment - certainly a far greater understanding than when we were children ourselves. 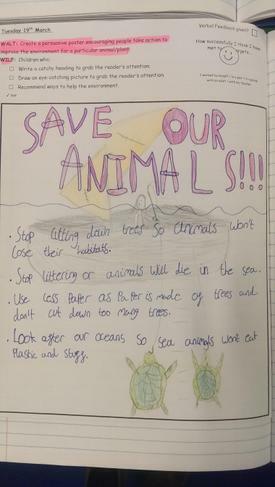 Following long discussions, children produced some super posters that aimed to persuade people to make small changes that help protect the animals on our planet. We look forward to displaying them around school! Another wonderful week has come to an end in Year 4! We have enjoyed discussing the progress of your children during parent conference meetings this week, many thanks for your attendance. In Literacy we have been exploring expanded noun phrases in our class text; The Butterfly Lion. The children have written some excellent sentences of their own and are becoming real experts at identifying them within texts. They have shown resilience whilst completing their Exciting Writing this week which has seen them rescue a lion cub from Muscliff Park! In Numeracy we have been comparing numbers with the same number of decimal places up to two decimal places. We have also been rounding decimals with one decimal place to the nearest whole number. In topic we have been looking at the importance of habitats for animals to have a safe and happy place to live. 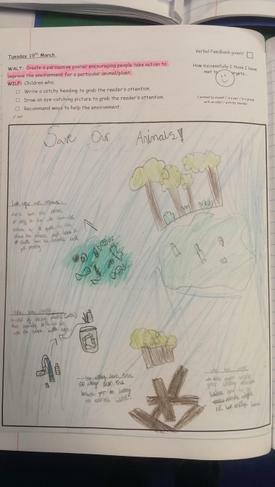 We have been thinking about threats to habitats and how we could create safe havens for animals. The children came up with some awesome ideas and illustrations of bug hotels and hedgehog hideouts. Today, we had an interesting musical session from Bow and Reed. The pair of talented artists played violins, guitars and even a concertina. We all enjoyed clapping along to the Irish, American and Scottish inspired tunes played. -Please can you collect shoeboxes for our Parent Craft activity and send these into school asap. -Please return Moors Valley trip letters to your class teacher asap also. Welcome back! We hope that you have had a super half term break? We are extremely pleased with how quickly the children have settled back in to the routines of school life. Literacy has been action-packed this week! The children have been introduced to their new class text, The Butterfly Lion by Michael Morpurgo. The text is beautifully written and links exceptionally well with our new topic Habitats. We have learnt about Bertie and his desire for freedom beyond the confines of the compound where he lives in South Africa. He longs to explore the open veld, full of exotic animals and made more appealing by his father's insistence not to leave the safety! During Bertie's many hours of yearning for all that is free, he sees something extraordinary at the waterhole...a white lion cub! His parents do not believe him despite his attempts at convincing them. One day, his father, a cattle farmer, shoots a lioness... could it be the mother of his illusive lion cub? In Numeracy the children have been revisiting multiplication and division strategies. They have shown superb resilience and determination to improve their learning. Today, we have conquered division word problems! Next week we will be learning about decimals which will be an exciting challenge for us all to tackle. Well done to all those who managed to gain maximum stars for their half term DoodleMaths challenge. The enthusiasm for this awesome website has been wonderful to see and without a doubt will help improve knowledge and confidence across all topics covered, keep going super stars! -Please can all children wear school shoes as a fair few have been wearing trainers which are not part of the school uniform. -Don't forget World Book Day is on Friday 8th March- we can't wait to see all the fantastic characters! Eric Carle inspired animal art- can you guess the animal? Reminder - The online system is open for booking slots for parent conferences. Letters went out before half term. We look forward to sitting down with each of you on Tuesday 12th and Thursday 14th March. We can’t believe it is the final week of the half term! The children have been working incredibly hard in all areas of their learning this week and we are very proud of them all! 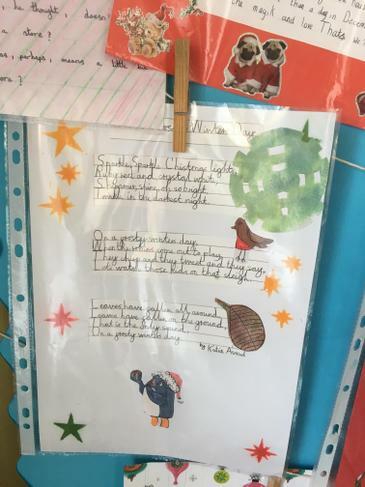 Poetry has been our focus in literacy and it has been fantastic watching the creativity flow around the classrooms! They started the week identifying the key features of a poem before creating their own and then performing to the class. The children did a brilliant job and we were so impressed with how they faced their fears of performing in front of an audience! Fractions, fractions and more fractions this week! Using a range of resources, the children have been learning how to add and subtract fractions before thinking about putting it all into context and solving some complex word problems. With the help of our Cuisenaire rods, the children successfully managed to solve the different problems. Well done Year 4! Our new topic next half term is habitats and at the end of the term, the children will be using all that they have learnt to create a habitat for the local wildlife. For this project we will be using shoe boxes. If you could keep your eye out for any shoeboxes over the next few weeks and send them into school, it would be much appreciated! The penultimate week of this half of term has finished! During Maths lessons we have been learning how to count in hundredths. This key skill has then enabled us to be able to place mixed fractions on a number line accurately. Equivalent fractions have been… tricky! We have been using practical resources to support our learning. For example; ½ is equal to = 2/4 = 3/6 = 4/8 = 5/10 =6/12 = 40/80! In Literacy, Flavia’s quest in The Thieves of Ostia continues! On Monday we wrote our diary entries for our Exciting Writing task. These beautifully crafted pieces of writing look spectacular written on scrolls in the very best handwriting. We are extremely proud of the children’s resilience and pride in their work as they have edited and improved their work over a period of lessons. We endeavor to reach the finale of this gripping read by the end of next week which will be truly exciting. Topic has involved the labelling of a Roman soldier and learning all about Boudicca. Boudicca was a Celtic Queen who led a rebellion against the Roman occupation of Britain. Although her campaign was initially successful, her forces were defeated at the Battle of Watling Street in 61 AD. Wounded soldiers wore spider’s webs! The sticky silk helped the skin to knit together. Tucking a bundle of herbs into the bandage was another trick-it killed germs! I have to start by thanking all of you who were able to attend the parents craft this week. The Roman tiles and mosaics look fantastic and we cannot wait to display them in our corridor for the school to see! See picture below. Also on Tuesday, children enjoyed their third ukulele lesson. They have progressed from knowing how to hold the instrument and play a single cord to learning a small number of cords and singing-a-long to a simple tune. It’s so lovely to see the children enjoying something a little different and having so much success. We look forward to seeing what they’ve learnt to do at the end of the full 10 weeks! In maths, we have come to the end of the topic on time with some exceedingly tricky word problems. Perseverance was the key to being able to decipher what the question was asking us to do. Any opportunity for further learning at home would be extremely beneficial to put what children have learnt at school into context e.g. If swimming starts at 16:35 and lasts for 1 hour and 25 minutes later, what time does it finish? or If I leave for the shops at 10:10 and return at 12:05, how long have I been at the shops? Another busy week in Year 4 has flown by, and haven’t we been busy! This week in Maths we have been learning how to draw and read line graphs. Accuracy has been a vital skill for this topic when constructing and reading the graphs to gather information. We have also been learning how to tell the time using the 24 hour clock. Time does indeed take time we have found! Please ask your child about their recently learnt knowledge as it is a topic that requires as much embedding through practical examples as possible. In Literacy our exploration of the Thieves of Ostia has progressed! We have encountered an orphaned boy, Lupus (Wolf), who Flavia has taken under her wing with the help of Jonathan and Nubia. Their quest to discover who/what has killed Bobas (the beloved watchdog) continues to escalate as their detective skills are pushed to the limit. We can clearly state we are well and truly gripped by this historic book! In our writing the emphasis has been on selecting powerful verbs to provide maximum impact for the reader. Fronted adverbials and adverbs have also played a key part in our daily writing along with adjectives to describe in greater depth. These are all vital skills which are expected of the children in Year 4. Great work has been produced which is fantastic to see! PE has involved a multitude of activities including; dodgeball, Monkey football, circuits as well as the fabulous, heart-pumping 1mile runs around the playground! Please make sure tracksuit bottoms (black/blue) and sturdy trainers are at school at all times as the weather is mighty chilly! Wishing you a happy weekend from all the Year 4 team! Yet another great week in Year 4 with children showing that they are ready, respectful and safe! In maths this week we have finished off our division unit. We are extremely pleased with the children as they have shown determination, particularly when completing word problems. We are now starting to explore bar charts and graphs. In literacy we have been reading about Flavia’s problem solving skills! We have started our exciting writes based on an item being stolen within Flavia’s house. We have had some gripping cliff hangers and we can't wait to read them! Just a reminder that parent craft is on Tuesday 29th January, please let your child’s teacher know if you can attend. Also, we have had a few children coming in with no PE kit. Please ensure that all children have their kits in school on Wednesday and Thursday. We have had a fantastic first week back to Year 4! The children have settled back in extremely well and have been working incredibly hard after a lovely break. We have thoroughly enjoyed listening to all that you got up to over the Christmas break and we hope you all had a lovely time! A new term brings a new text – The Thieves of Ostia. It has been a nail biting beginning as we have seen our main character, Flavia, try to solve the mystery behind her fathers missing signet ring before getting stuck up a tree after being chased by a pack of vicious dogs! We can’t wait to see what happens in our story next and how we will use this story to inspire our own writing next week. Division, Division, Division. This has been our focus in maths this week and the children have blown us away with there fantastic knowledge and resilience when solving some challenging questions using remainders! This is only the beginning of our work on division and we will be carrying on with this next week. A selection of Year 4 home learning. Amazing poetry and beautifully presented! What a wonderful week to end the term! 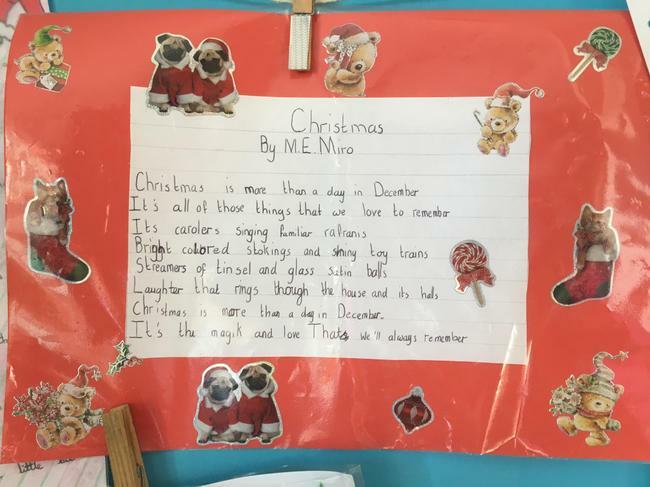 Along with many festive activities, children discussed the importance of Christmas and what Christmas means to them. It was lovely to share and listen to different family traditions around this holiday time. Yellow team was the winning house team this term having collected more VIP tokens than any other team and were rewarded with extra play time. Well done to all house teams – this term more VIPs than ever before have been awarded. Next term, our topic will be the Rotten Romans! We will be exploring the Romans both in literacy and topic. Don’t forget we have our magical starter day on Friday 11th January, where children will be able to dress up as a Roman. Not only that, the children will experience the day in the life as a Roman. Please remember to save any boxes for an activity on our Roman day! Finally, thank you so much for your generous gifts and kind words. We hope our small gifts to the children made it home safely and don’t cause too much mess at home! We would like to take this opportunity to wish you all a fantastic festive time. Be together, be safe and we will look forward to beginning a new year in 2019! 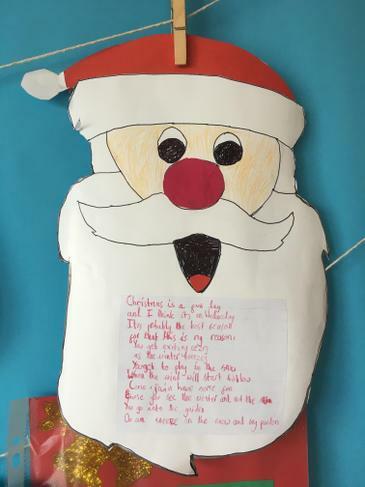 Christmas cheer has well and truly landed in Year 4 this week! The children have been feverishly making moving elves, reindeers with googly eyes and trying to solve some horrendous Christmas jokes by answering multiplication questions first to break the code! In Maths we have been looking at multiplying single digits by three digit numbers. The children have been using some fantastic column, partitioning and place value knowledge to ensure that their workings are accurate. Varjak Paw. What can I say? We are so tantalisingly close to the end of this gripping story that I think it'll be bitter-sweet when we finally finish it this coming week! We have been so pleased with how engrossed and enthralled the children across all the classes have been with this puuurrfect story of one very brave Mestopotamian Blue. This has been an action-packed half term and we are very proud of all the children for their hard work and determination. Dates: Please remember that school collection will be at 1.30pm this Thursday. Resilience has shown through this week in Year 4 as we have completed our assessments. The children have been working incredibly hard and have shown great determination when answering some challenging problems. We are extremely proud of them! This week, we have continued our journey with Varjak Paw looking at adverbial phrases. The children have been thinking about different ways that they can structure their sentences and the effect it has on the reader. We look forward to them applying all there excellent knowledge in their exciting writing next week! The children have continued to look at circuits this week and have tested different scenarios to see if the electrical current can flow to light up the bulb or whether it is broken. The children showed fantastic team work and thought carefully about their prior knowledge to see if they could predict if the circuit would work or not. You may have heard that a few of Santa’s little helpers have joined us in Year 4 to help us show kindness and get ready for the Christmas holidays. Keep your eye out next week to see what our Elves have been getting up to! Topic this week has been an absolute delight! To hear the buzz of excitement along with cheering and clapping when groups had worked as a team to complete an electrical circuit and were rewarded by seeing their light bulb come alive is what teaching and learning is all about. I can tell you now, we have many talented scientists and electricians in the making! Doodlemaths continues to be a hit with the children and it has been great to see each of the Year 4 classes on the school leader board at different points of the week. Many children and parents are aware of a separate 'doodletables' app which works in a very similar way to doodlemaths but, as the name would suggest, focuses purely on times tables. It's a great way of supporting children with their weekly times table challenges in school. Login details are the same as doodlemaths however, stars are collected into a separate pot. It is there as an optional extra! Amongst lots of revision in literacy and maths this week, Year 4 were treated to watching both Rainbows and Year 1 Christmas performances. What stars they were! Thank you for your ever-generous donations for the Muscliff's Christmas fayre. I'm sure we'll see lots of you there tomorrow... Don't forget to look out for our lovely snowmen decorating the hall! As Lavender class remind Miss Vella EVERYDAY-it’s only 33 days till Christmas! Our maths focus has been worded problems this week. It was tricky in parts but, with a positive growth mindset, children have had lots of success. Children learnt how to select the correct maths operation needed in order to solve problems accurately. In English we have been following Varjak’s latest adventures and wondering if he will ever return to the Contessa’s house. We have been focusing on using a range of coordinating and subordinating conjunctions in our writing to add effect. We have also started to look at using noun phrases to describe the alleyway in which Varjak hides whilst Sally Bones is on the prowl. Christmas spirit has hit year 4! On Thursday we had parent craft where children made fabulous snowmen tree decorations. Children worked with varying degrees of adult support (!) to learn how to thread a needle and sew on details like eyes, mouth and buttons! Even Miss Vella and Miss Follenfant learnt to sew a button! Thank you to all parents who were able to help out. Well done to all of the children for accessing Doodle Maths and collecting lots of stars, we are impressed with your efforts! Monday’s literacy home learning is Blog-tastic. Children will be challenged to be authors of their own blog and identify the style, features and purpose! Another super week has passed in Year 4! We are extremely proud of those children who have embraced the challenges set in DoodleMaths. Class teachers will continue to review weekly progress and check that all have available access to computers to make the most of this fantastic new resource. In Maths we have been looking at solving word problems involving multiplication and division. These have been tricky to master but all have shown great resilience and determination to break the questions down in to manageable chunks. Kindness has been of utmost importance this week. 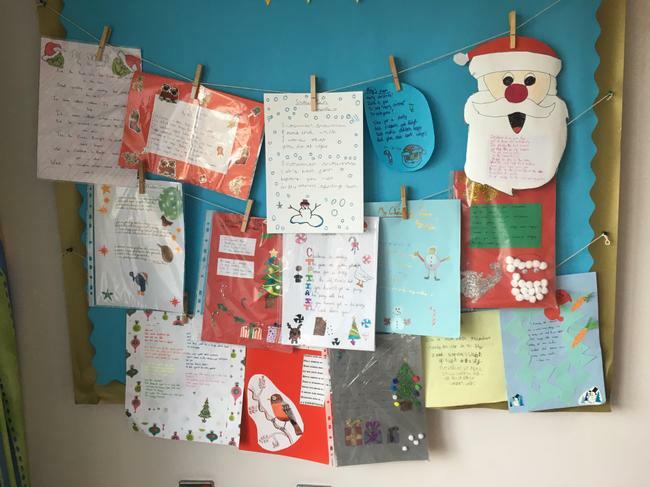 We have made kindness postcards, shared a kindness activity with Year 1 children and enjoyed sharing messages of kindness from posters in the corridors around school. Thank you for all your wonderful cake contributions! We hope to have raised lots of money for such a worthy charity. The children looked smashing dressed in their brightly coloured clothes. Parent craft is this Thursday so please can you return any slips to us so that we can have an idea of numbers. Needle and thread at the ready! THIS FRIDAY AFTER SCHOOL - CAKE SALE FOR CHILDREN IN NEED!! Please bring in cake donations in return for mufti on Friday. There will be a cake sale outside each year group's exit where each cake will cost 20p. Please help us raise money for this excellent cause. We have had another fantastic week in Year 4! We have ventured further into the bustling city with Varjak where he has continued to learn from Jalal. The children are really enjoying this text and we can’t wait to continue our journey with them next week! Grouping and sharing has been our focus in maths this week! We have been sharing cupcakes (pictures of them unfortunately!) and comparing sharing to grouping them. The children have then been using their times tables and the inverse to check their answers. We are really proud of them! Using the powerful imagery from our text, the children have created silhouette pictures of the big city inspired by Van Gogh. The children showed great skill when using the wax crayons to create swirls to create the night sky. Have a look at the images below to see the finished products! 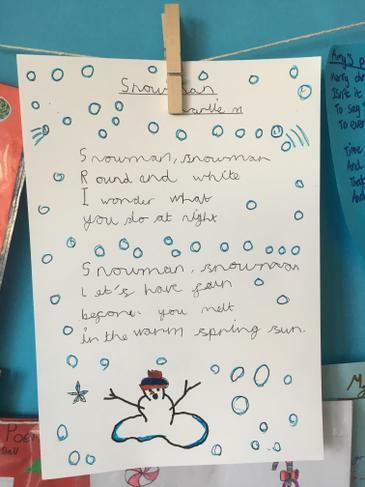 To finish off, we thought we would leave you with some comments from the Year 4 children and what they have been enjoying so far this term! In Maths, No Problem! lessons, a new chapter has begun. For the coming weeks, we will be looking at multiplication and division facts within the 12 times table. Many children are already confident recalling facts through their weekly times table challenge but it’s also important that children can understand and represent multiplication and division problems in different ways (using concrete apparatus, pictorially as well as abstract). Click on the tab above to see the full topic overview with areas of the Curriculum we will be covering this half term. Check out our wonderful art work from this week that is already on display in the Year 4 corridor! Has your child LOVED reading David Walliams' Gangsta Granny? Check out his other titles in our 'Author of the Month' display. What a great first half term Year 4 have had! Staff are extremely proud of the children for consistently modelling how to be ‘Ready, Respectful and Safe’. We have had a busy few weeks in maths, learning a range of methods to support us when adding and subtracting. The children have found some of these methods tricky; however, their growth mindsets have helped them to succeed. In literacy, children have been learning about the difference between formal and informal language, both spoken and written. The children then applied their new learning to complete an exciting piece of writing pretending to be Ben writing an apology letter to the Queen! We had our exciting ending to our Gangsta Granny topic, where Grandparents came in for cake and a cheeky game of Boggle! The children loved asking their Grandparents questions about their childhood and it was interesting to see how generations have changed over time. See pictures below. A big thank you to Grandparents for coming into school. By the end of the week, each class had finished the Gangsta Granny story and a few tears were seen in what was an emotional end to the book. It has been an extremely successful and engaging narrative and we look forward to introducing a new text after half term. Please don’t forget to book your slot for parent consultations on the 6th and 8th November. Also, on the 8th November at 2.15-3pm we have a parent workshop to launch ‘doodle maths’. More information to follow. We have reached the end of week 6 already! Lots of learning and fun has continued in Year 4! In Literacy we have been learning about different text types and what author’s do to capture our interest and imagination. We thought about the audience and purpose of a text and related this to our class text Gangsta Granny. We also reviewed noun phrases and worked hard to include these in a description of a getaway scooter, of our own design. Finally, as we approach the end of the book we focused some time on comprehension, to really show our understanding of the text. In Numeracy we have been using the formal column method to subtract. This has included renaming (borrowing). The children have been required to think carefully about their knowledge of place value in order to be successful using this method. In Topic we have been finding out about Victorian prisons and hard labour! The children were asked to imagine they were a prisoner and write a diary entry explaining how they feel and what life is like in prison. We had lots of interesting discussions around the idea of being silent and repeating monotonous tasks! We are looking forward to our Exciting Ending next week. Thank you to all children who have returned their slip to inform us whether their grandparents are able to attend. We look forward to seeing all grandparents for afternoon tea, next Wednesday 17th October in the hall at 2.30pm. Next week is our final week this half term! Please remember we finish at 3.15pm on Friday! Another super week in Year 4! It may have been incredibly busy but all have pulled together to work their absolute hardest so well done staff and children alike. This week in Literacy we have been exploring prepositional phrases and their relevance within the super text Gangsta Granny, (focusing on chapters 18-19). The children have enjoyed using their prepositional detective skills to identify and then apply prepositions to their own writing. We have been very impressed by their hard work and determination with this tricky task and feel that they have understood and improved their writing as a result of this so well done! In Numeracy we have been continuing our study of formal column addition with renaming (exchanging). The children have been embedding greater knowledge and a greater depth of clarity as to why and how numbers are renamed. Topic has seen us explore who the Highway Man was and whether or not he was a hero or a villain! Why not ask your child about their opinion on this interesting topic and see if they can convince you with their stand point. PE has seen the children taking part in team games. The children have worked alongside their peers and worked as a team. Well done Year 4! Celebration-A huge congratulations to Charlie and Jake on your exemplary behavior that has quite rightly gained you a certificate in today’s Good News Assembly. We are exceptionally proud of those children who always show us the Respect, Readiness to learn and Safe ethos to learning and their environment which these individuals have shown this week. Home Learning- We continue to be immensely proud of those children who are completing their Home Learning each week. Those who hand it in immaculately presented, on time and to the best of their own ability. A huge well done, we are noting down those of you who are repeatedly impressing us with your hard work and determination to strive forward in your learning. True Muscliff Mice! Here’s to another fantastic week next week! Keep up the reading for the reading challenge, practice spellings and times tables and have an enjoyable weekend! Half way through our Crime & Punishment topic and Year 4 are totally engrossed . This week we posed the question 'How did crime and punishment change between the Anglo-Saxon and Tudor periods?'. Having already learnt that Anglo-Saxon punishments were extremely harsh, we wondered if by the Tudor period, punishments became less brutal... but no.. punishments were as ruthless as ever! In the second of two topic lessons, children were astonished learning about the power and influence that Henry VIII had over his people and the law. Ask your child for Henry VIII facts that they can remember! Acting out scenes from Gangsta Granny proved a huge success earlier this week and gave children opportunities to perform in front of the class! Great job! In maths, children needed a growth mindset to face the challenge of rounding numbers to the nearest 10, 100 and 1000. We were really impressed by the learning attitude of all children in what was a really tricky few lessons. We will be revisiting the skill of rounding in the coming weeks! We have had some fantastic PE lessons this week with a focus on developing dribbling skills and throwing and catching, with Orlaya class completing team games including parachute activities. It was refreshing to see the children enjoy their time outside communicating with their peers. We had great fun completing a tower challenge this week during enrichment time. The children built a tower out of spaghetti and modelling clay. See pictures below! Well done Year 4 for showing us how you can be ready, respectful and safe this week! The end of the first full week in Year 4! It has been a busy week filled with X Tables tests, Exciting Writing and a fantastic Curriculum meeting. The curriculum evening presentations have now been added to the class page. See the tab 'Useful information and links' at the top of the page. Thanks again to all who managed to attend and those who sent their apologies. Your feedback was lovely to hear :) Do remember our door is always open if you need to talk to us. The children have been working really hard to obtain as many VIPs as possible this week and have impressed us with their hands-up for silence in and around school. Super work, keep it up! -Home Learning will go out on Monday and spellings will also be tested on Monday. We have already received some outstanding pieces of home learning so a huge well done to those who have managed to hand it in already. -Reading Rangers- we would very much like to see as many parents as possible be involved in reading with children in Year 4. If you are able to do so between 8.30-9.30am on any morning in the week then please do let us know. Here's to another super week next week! Welcome back and into Year 4! We are sure there will be some very tired children (and teachers) returning home from their first week but how impressed we have been! Perhaps the highlight from the first few days was our magical starter yesterday afternoon where, after lunch, a crime appeared to have been committed. Crime scene tape was cornering off key areas of evidence, witness statements had been gathered and evidence cards had been placed against certain key items of interest. It was fantastic to see children's excitement and response, putting on their detective hats to use the clues to discover who may have committed the act. The grey/white wig, cabbage, SWAG bag, jewels, murray mints and glasses amongst other items lead us to believe that Gangsta Granny herself had visited our classrooms! Children have been introduced to our new school rules: Ready, Respectful, Safe. With such clear expectations all around school, children have shown great understanding in all areas. Letters went out today reminding parents or the Year 4 Curriculum Evening next Thursday. Please do let us know if you're able to attend by returning the attachment. Home learning will be sent out on Monday along with a topic overview. In the meantime, please do continue to read with your child and practise times tables! PE days are Wednesday and Thursday - please ensure PE kits are in school. Beginning a new school year with so many new children and parents, we have appreciated your patience as we have sent children from the gates at the end of the day. Thanks to parents giving children / adults a wave to ensure everyone is collected safely. Our first topic will be based around Crime and Punishment. A topic overview will be available in September. Not all these books are relevant for year 4 children obviously but they may give you some ideas for mixing it up a bit and where to go in the future. Reading IS the future! and our wonderful castle point library of course who will give you loads of pointers. Aim for a variety and consider the stamina necessary for the year4 reading test ('Diary of a wimpy kid' just won't cut it every week!). Below is the link to a range of fantastic maths websites, which would be great to use if your home learning does not take the expected 30-40 minutes a week.